Does anyone have any information or opinions about the Sol Cat 15? (Actually closer to 16', but probably a marketing thing.) I am considering buying one this weekend for cheap - < $700. Sail is in good shape (main only) the fittings and trailer are good, the hull has a small fixable crack where the stern cross brace contacts the hull and there's some sketchy paint work on at least one hull. I needs a new tramp right away, and I've found some around $220. I've read a fair amount on these forums and the consensus seems to be: buy Hobie. I am in the Denver area, and there aren't a lot of boats for sale around here. The H16 is heavier, and the raised tramp has pros and cons. And I kind of like the idea of bringing an orphan back to life. I will be mostly solo sailing and have a lot of experience in all kinds of smaller boats, but just want something faster than a monohull that I can sail off a beach. (Pretty sure a cat trax is in my future) Sol Cat seems to have had a short life as a brand, and the 18 was more popular. I was looking at the Wave for indestructibility, but they are hard to find for less than $3000. I would keep looking for a hobie or prindle 16....more parts etc. Edited by jalex on Sep 17, 2018 - 08:31 PM. Thanks for all the replies! The hull crack is minor, as far as I can tell from the pics. The seller has been very up front about issues which I appreciate. Thanks Pete, I did see the H16, and I really should go see that one as well. It is about 50lbs heavier than the Sol Cat, and I am not sure I like the raised tramp. It seems like it would be dryer, but doesn't it restrict your lounging area as well? Does anyone ever put a tramp in front of the mast on the H16 for the kids to hang out on? I have never been on either one, so kind of guessing. Where I sail is mostly light breeze, so stretching out is important. Mike, the Hobie 16 hulls are very different from the Sol Cat. They are a skeg design that does not use centerboards. They are relatively low in height so the tramp must be elevated to clear the water. Due to the low profile of the hulls there is not enough flotation to support a forward tramp or even larger crews. Too much weight forward on the H16 will result is a very fast pitchpole if the bows dig into the water. A forward trampoline is a generally bad idea on any cat except in light winds and low waves. There is no good way to get a forward tramp on a boat not designed for it with an additional forward crossbar. I think the G-Cat was an example of a boat with a forward tramp. The higher hulls on the Sol will provide more floatation and forgiveness and the centerboards will help with pointing into the wind. The downside of boards is shallow water and beaching. Cat Trax changed my life. It is much easier to move the boat around and get it on and off the beach. They can prevent a lot of wear and tear on the hulls and make your life easier. Edited by jalex on Sep 18, 2018 - 12:46 PM. H16 has a buyer (Craig's List, so who knows?) and I think I am still in love with the poor slightly neglected Sol Cat. It's kind of like going to the Dumb Friends League and picking the scruffy mutt with the bent ear and one eye over the much nicer lab mix. Going Saturday so we'll see. Maybe I can get a better price. Sounds like a Cat Trax for Christmas! Thanks again! I will post pics if I buy her. tominpa - those are too big for me. I need to beach launch on my own, so really need to keep the weight under 300lbs. I'm not even really sure I can handle that. There's a bit of a ramp out of our little reservoir beach. I might have to hit the weights! The H16 did sell yesterday, so that wasn't meant to be. Bought the Sol Cat yesterday for $640. Hull is rough but sound, sail is good, trailer was painted, but only the parts you can see. Rusty underneath. Hardware mostly good, but of course needs some new bits. Amazing that anyone would put non stainless HW on a boat. And am guessing this lived some of it's life in humidity since we don't see rust like this Denver's dry air. No tramp, so going to order that. It will be a long winter waiting for spring! Edited by mikeguestuser on Sep 24, 2018 - 04:03 PM. Should be a fun launch next Spring. Get the tramp sorted and inspect the standing rig closely. It's not hard to have new wire fabricated if needed. It's pretty rare to see running sheets in good shape, and getting some New England Rope is a good way to make the boat feel fresh at a reasonable cost. I have done full hull refurbish and paint. The Sol Cat looks like someone laminated a couple layers of fiberglass over damage and wear. This is not a problem, but if you want it to look amazing, just do a lot of sanding and grinding, and use fiber-filled epoxy resin to make it smooth (more sanding), then paint with a marine paint. It can look and feel like new. Just depends on how much time you can invest. 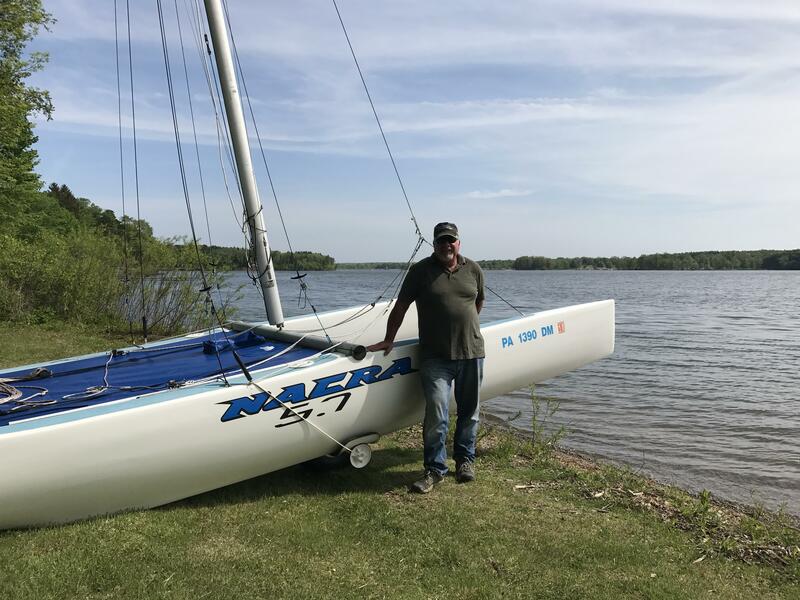 My 1984 Nacra 5.7 is one of the best looking boats on the lake...unlike me. Oh, I launch and beach this cat solo using beach wheels. Edited by tominpa on Sep 23, 2018 - 10:37 PM. Started sanding today, and hoping some of you old timers are still checking. First - I can't figure out to attach pics, but I am sure it's somewhere on the FAQ's. Getting after the bad patch job and that is coming out nicely. There also a lot of small to larger scratches along the bottom of both hulls where the boat was obviously dragged on rocks. I can't decide if I want to try and go over them with a thin layer of epoxy or just do more sanding and hope the paint fills in the scratches. Last time I did a boat bottom (MANY years ago!) it was in a lot better shape. Any advice? I know it's hard to tell without seeing it, but they are in the 1/32nd - 1/16th and quite shallow range. Only a couple are deeper.